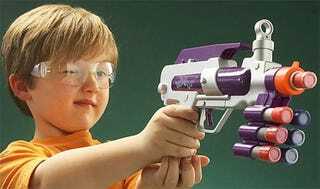 I consider myself a toy gun aficionado—one who is versed in the latest non-lethal, non-painful weaponry. But I'd never heard of chalk guns before. 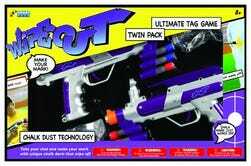 The WipeOut Chalk Gun is like a Nerf toy with ammunition tricked out by a school teacher. Packing chalk-tipped bullets (those just sound illegal, don't they? ), hitting your target will leave a mark of "chalk dust" that's simple to wipe away. It's easy cleanup for mom and even easier arguments for kids, as screams of "he cheated" are muffled by clouds of non-toxic colored powder.